Christmas feels a little different this year. I can’t exactly put my finger on it as to why – but we decided to do some Christmas baking to get us all into the spirit, and thankfully it did the trick! I’ve never tried baking Gingerbread. To be totally honest, I always thought it’d be too tricky. Creaming the butter and sugar…(all too hard without a KitchenAid), but I found this super simple recipe and tweaked it a little, and I’m so pleased with how they’ve turned out. You’ll probably find you have most of these ingredients in your pantry. – Place butter, golden syrup and sugar in a medium saucepan over medium heat. Cook for 3 minutes, stirring until the butter is melted and sugar is fully dissolved. Bring to the boil, then remove from heat. Add bicarbonate of soda and stir to combine (the kids loved this part!!) Transfer to a large bowl and set aside to cool. – Sift flour, ginger, cinnamon, nutmeg, cloves and baking powder over butter mixture. – Add the egg and stir until combined. – Scoop mixture out onto lightly floured bench and gently knead until smooth. – Divide mixture into two equal portions. Shape each portion into a disc and cover with cling wrap. Place in the fridge for 45 minutes. – Preheat the oven to 180ºC and prepare 2 baking trays with baking paper. – Roll one portion between 2 sheets of baking paper until 5mm thick. 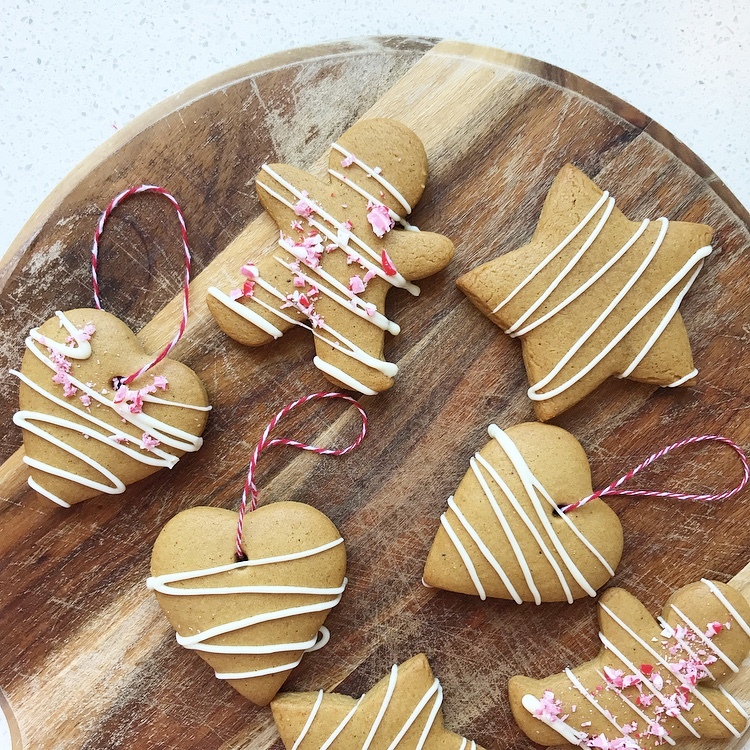 Use whichever cookie cutters you like (we did hearts, stars, angels and the traditional gingerbread man shape). Use the scraps and keep rolling until the dough is all used up. – Place on prepared baking trays leaving an inch or so between cookies for spreading. – Bake for approximately 8 minutes, or until firm to touch. – Allow to cool on wire rack and be sure that cookies are completely cooled before decorating. We just used melted white chocolate and some crushed candy canes to decorate, but you could go nuts and do whatever you’d like – or they’re tasty enough to leave undecorated too! I also popped a few holes in the top of some of the hearts before I baked them, using a metal skewer, so I could make them into little hanging cookies. SO CUTE!!!!!!! So there you have it – a basic gingerbread cookie recipe. Next time, I am going to attempt building a gingerbread house!! Recipe makes approximately 40 cookies.